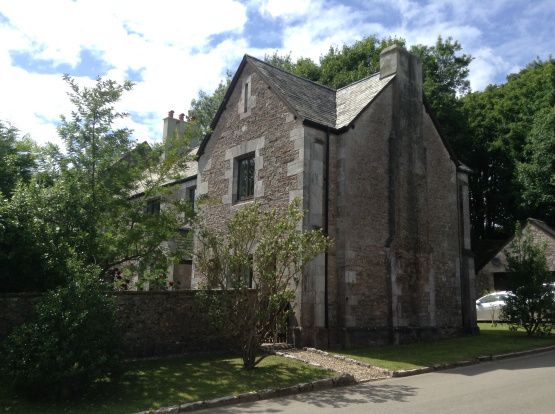 For the first time in 25 years the opportunity to acquire an imposing, unique, attached stone farmhouse, circa 1850, has presented itself. The Farmhouse, 4 Higher Alston Farm available without a property chain, is located in one of Torbay's finest and desired residential areas in an attractive hamlet of old stone buildings, located on the outskirts of the delightful village of Churston Ferrers and set within a tranquil Conservation Area. The Farmhouse accommodates four generous sized double bedrooms and two large reception rooms. A stone double garage and off-road parking for three vehicles on the driveway provide further practical benefits. Level front and rear gardens rising to woodlands surround the property and extend to approximately 0.9 acres. The approach to the Farmhouse leading into the level front garden via a wooden gate in the capped stone fence lends the grand entrance the property deserves. The front of the building faces the central courtyard and presents a magnificent façade of unique architectural features. The Farmhouse boasts a slate roofed limestone porch with flagstones. Window surrounds, quoins and buttresses are all constructed of limestone too and dressed with a feature margin edging. The porch leads to the original large wooden front door with wrought iron ring knocker with limestone arch surround in the Tudor style. Talk about making an entrance. The location of the property allows easy road access in all seasons to the M5 motorway, A38 and Exeter Airport for national and international destinations. There are mainline rail stations at Paignton and Totnes to London Paddington and Victoria and the North. From the property it’s only a five minute walk to Churston Ferrers Grammar School. The Farmhouse is offered to the market with a price of £620,000. For further information please contact Marchand Petit’s Totnes office on 01803 847979.